The Square Four started as a twinkle in Edward Turner’s eye back in the 1920s when he worked at BSA. 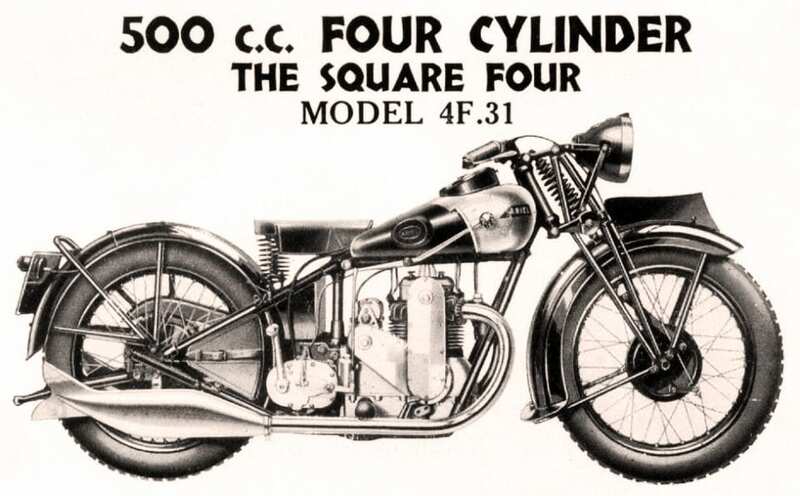 After moving to Ariel and enlisting the aid of engineer Bert Hopwood, Turner’s idea was made into metal in 1931 in the shape of the 4F 500cc Square Four. 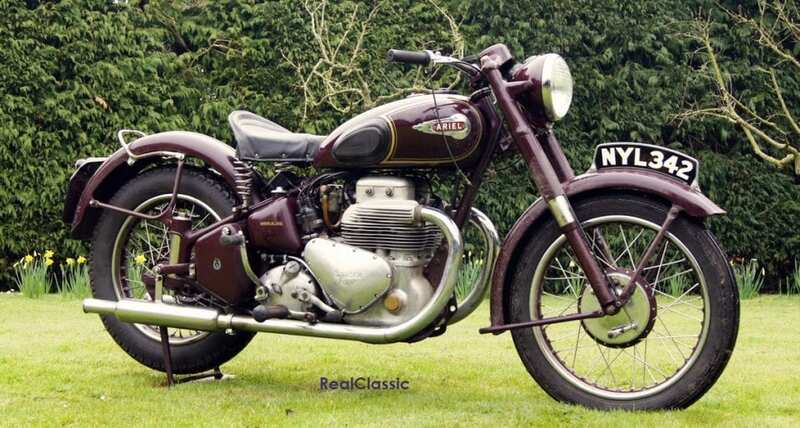 This remarkably compact powerplant was slotted into a twin downtube chassis similar to that used by Ariel’s 500 singles, using girder forks and a rigid back end. The original OHC engine is a bit like two parallel twins which shared a common crankcase with the two crankshafts geared together at the middle pinions, and a common cylinder block and head. The overhead camgear was chain driven. Early bikes used a hand-change, four-speed Burman gearbox. 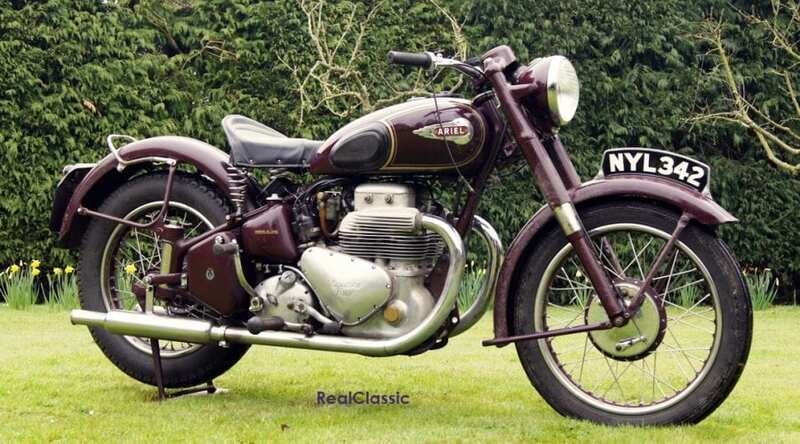 Turner hoped to ‘provide a four-cylinder engine small enough for use in a solo motorcycle, yet producing ample power for really high performance without undue compression, racing cams or a big-choke carburettor. I was aiming at the ultimate reliability with the minimum of attention.’ However, ‘really high performance’ wasn’t quite on the cards. Instead the Square became a heavy tourer, famed for its long legs and relaxed ride. When Turner moved on from Ariel, Val Page continued the Square’s developments and it grew to 600cc with a little more power, intended for use as a sidecar tug. It was very smooth but somewhat sedate, and the engine was not easy to tune for peppier performance. 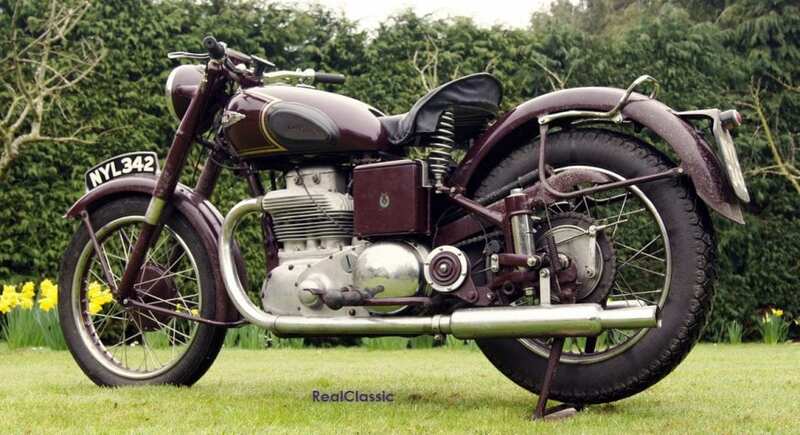 By the late 1930s the 997cc Square was introduced with an OHV pushrod, all-iron engine, alongside a similarly-engineered 600cc version. The front end still used girder forks but the rear utilised Frank Anstey’s sprung rear suspension system as an optional extra. A major redesign was needed for the next decade, so in 1949 the 4G Mk1 was launched with an all-alloy engine running a 6:1 compression. 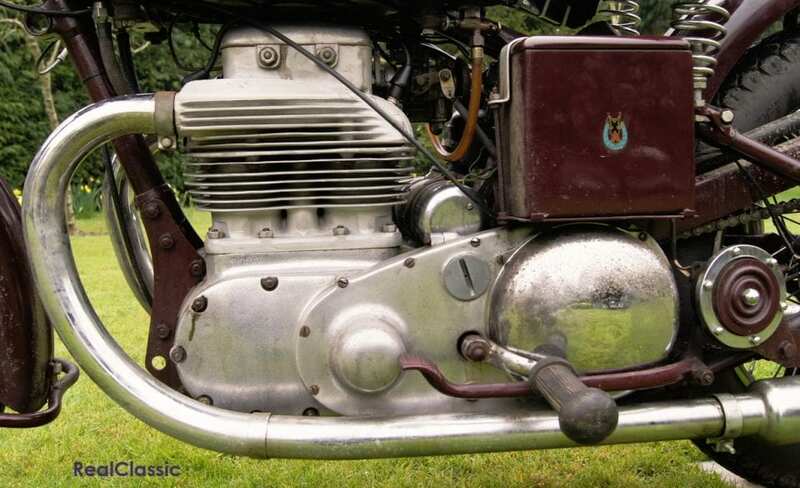 Although the bottom end was much the same as before, the cylinder head, valve gear, crankcases, rocker boxes, exhaust manifold and such were all overhauled. These modifications helped the Square’s cooling and reduced its weight to under 200kg, as well as giving acceleration something of a boost. 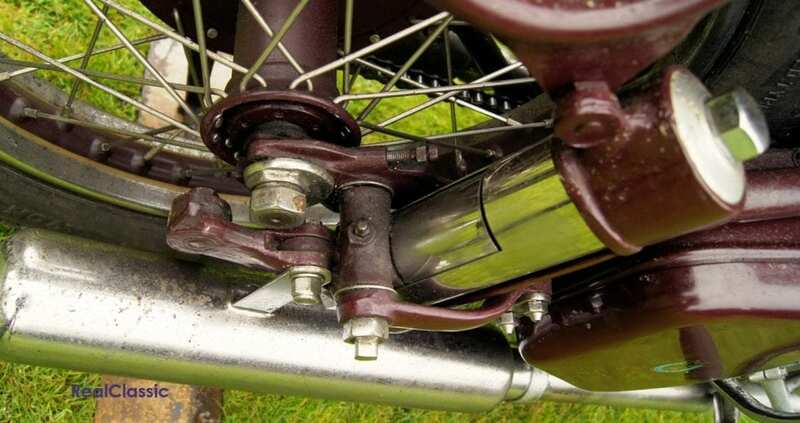 Braking was provided by single leading shoe, seven-inch drum brakes at each end, and an eight-inch brake arrived in 1951. Fuel consumption wasn’t spectacular for the time, at between 40 and 50mpg. The twin-pipe 4G Mk1 Square could exceed 90mph, and its gentle power delivery provided ideal propulsion for the fully-laden outfit, giving smooth, seamless acceleration from low revs. 35bhp went an awful long way in those days! It helped that the 4G produced its peak power at just 5500rpm with that broad spread of tractable torque. 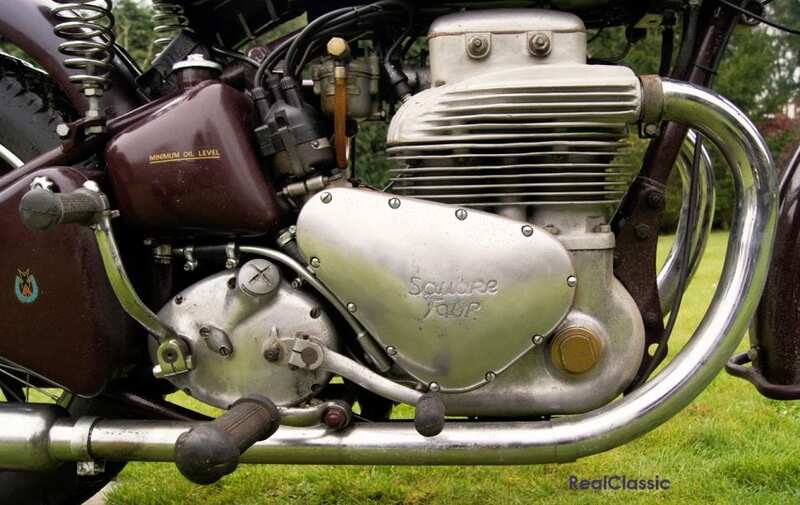 Another update in 1953 created the Mk2 4G which featured the model’s fabulous four-pipe exhaust system. 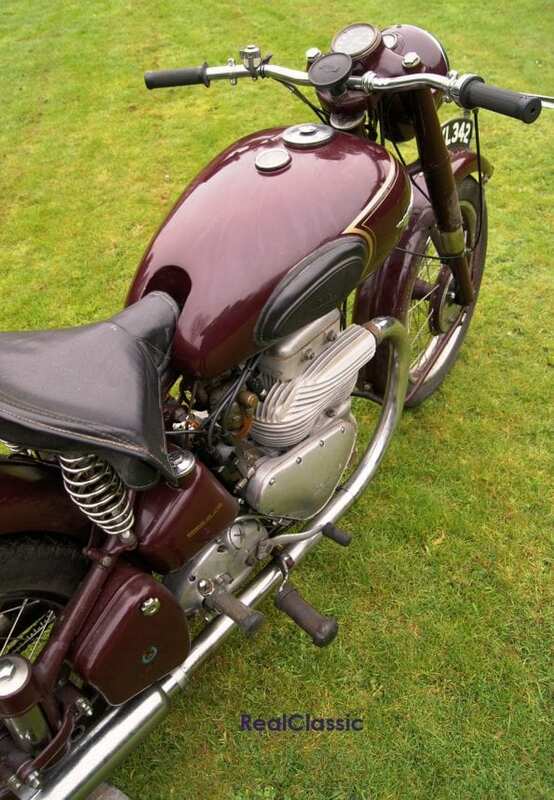 Although Ariel built prototypes of a Mk3 with Earles forks in 1954, and experimented with swinging arm suspension, these weren’t put into production so the Mk2 ended the line when it was discontinued in 1959. Riding a Square remains a singular experience. 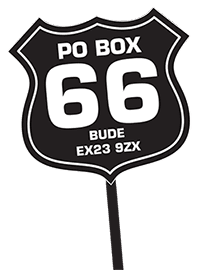 The power characteristics of the four-cylinder engine are nothing like those of Japanese machines and – to unfamiliar ears – its normal clatter sound terminal even when the motor’s in perfect health. Nor does a Square handle like a British twin. If the rear suspension has been well maintained then the steering is steady and predictable and more than capable of sustaining high speeds around fast sweepers. But soggy forks, worn Anstey links and marginal brakes are an unforgettable (not in a good way) combination.